Tech & Learning reports on the latest classroom computers, laptops, hardware, software, furniture, and more for schools and districts. Aperture Education is launching the Devereux Student Strengths Assessment-High School Edition (DESSA-HSE), a powerful, reliable, and psychometrically sound tool to help educators, parents and out-of-school-time organizations measure the social and emotional competencies of students in grades 9-12. Educators can use the assessment data to identify students’ SEL strengths and areas in which they may need additional support. Schools, districts and out-of-school-time organizations can also use the data to measure the effectiveness of their SEL programs. Casio America, Inc. has launched ClassPad.net Version 1.0 following a successful Beta campaign. Designed as a one-stop shop for educators and students, ClassPad.net is an all-in-one web-based mathematics creation and discovery resource geared for K-12th level and beyond. Version 1.0 will offer all of the features included in the beta version as well as new additions such as dynamically linked representations, additional types of graphing interactions, improved authoring tools, and more. Certiport announced a certification program for secondary schools and higher education in partnership with EC-Council. Certiport and EC-Council will launch the EC-Council Associate Series certification exams, practice tests, and curriculum beginning in fall 2018 starting with the Ethical Hacking Associate (EHA) and Cyber Forensics Associate (CFA) exams. EC-Council currently offers professional-level certifications, but the new Associate Series exams validate entry-level knowledge and prepare individuals to continue learning best practices for today’s cybersecurity threat landscape. Comcast announced it has now connected over six million Americans to the Internet through its Internet Essentials program, a comprehensive broadband adoption program for low-income families in the U.S. The company connected more than two million people in the last year alone, which is the largest annual increase in the program’s history. The company also announced it will significantly expand eligibility to low-income veterans, nearly one million of whom live within the Comcast footprint. Discovery Education and New York’s Yonkers Public Schools Collaboration (www.discoveryeducation.com) New York’s Yonkers Public Schools(YPS) announced it has engaged Discovery Education to support its efforts to build a culture of student inquiry in classrooms districtwide. Through this partnership, all 39 YPS schools will receive access to Discovery Education Streaming Plus, empowering teachers and students with thousands of high-quality learning resources and a suite of content creation tools they can use to create immersive learning experiences that ignites the spirit of curiosity in each learner. Classworks by Curriculum Advantage, Inc., released several upgrades for the 2018 - 2019 school year. Classworks activities are now available to teachers and students on any device used in today’s classrooms, and includes new mathematics instructional videos. Classworks also launched three new professional learning options for customers, including Smartguide, Kickstart, Connect, and Navigator. A diverse professional learning catalog ensures that teachers receive the training they need in the most convenient and effective way. New York’s Yonkers Public Schools(YPS) announced it has engaged Discovery Education to support its efforts to build a culture of student inquiry in classrooms districtwide. Through this partnership, all 39 YPS schools will receive access to Discovery Education Streaming Plus, empowering teachers and students with thousands of high-quality learning resources and a suite of content creation tools they can use to create immersive learning experiences that ignites the spirit of curiosity in each learner. Follett announced its book fair business is expanding for the 2018-19 school year to offer fairs focused for early childhood (PreK-1) and middle school (grades 6-8). Because of its existing partnerships with thousands of publishers, Follett Book Fairs offers a vast selection of books for early education, elementary, and middle school students. Moreover, Follett encourages participating schools to be closely involved with product selection, allowing for customization for their unique needs and demographics. Kahoot! launched a major mobile update that will allow users to create and host kahoots right in the Kahoot! app, even on the go. The app’s new update supports Kahoot!’s “learners to leaders” pedagogy that empowers students to take control of their learning and go from consumers to creators of knowledge. In addition, users can now create fun quizzes on the go and host them for friends or family, or set a challenge. itslearning announced its collaboration with Google for Education, delivering the first phase of a comprehensive technology roadmap. This initial milestone aligns with the itslearning mission to improve the efficacy of technology in education. The collaboration will involve significant work across R&D, Sales, and Marketing functions. With phase one complete, capabilities include one-click copying of single Google files, easy administration of assignments via Google Drive, collaboration and real-time feedback in Google Docs, and more. McGraw-Hill Education and Sesame Workshop announced an agreement that will bring research-based Sesame content and expertise into prekindergarten (PreK) and elementary school classrooms across the United States. Early childhood experts at McGraw-Hill and Sesame Workshop are integrating Sesame’s proven content and engaging characters into McGraw-Hill’s Wonders literacy program at the critical PreK-Grade 1 levels to create a new experience for students; social emotional learning lessons will continue through Grades 2-5 in developmentally-appropriate ways. Students and educators can now use Minecraft: Education Edition on iPads to engage students in STEM, inspire creative projects across subjects, and build important skills in communication, collaboration and digital citizenship. Teacher’s also have access to tutorials and other free class resources via Education.Minecraft.net. The app will be downloadable in September. The consumer version of Minecraft will also get the Chemistry feature so kids can play and build compounds even after class. PowerSchool announced the closing of its acquisition of PeopleAdmin. PowerSchool’s customers will benefit from PeopleAdmin’s talent solutions for teachers including TalentEd and assessment tools such as Performance Matters, providing them with a full suite of technology solutions that powers all critical aspects of school and district operations. The combined entity will reach over 45 million students and 13,000 school and district organizations including 88 of the top 100 districts in North America. Scientific Learning Corp. announces the release of the Fast ForWord Foundations I program. The Fast ForWord Foundations I program, which is the new version of the flagship Fast ForWord Language program, includes an intelligent back-end engine that intuits when a student is struggling and provides just-in-time interventions personalized to each learner’s strengths and weaknesses. With this SmartLearning Technology, educators can deliver smarter, more focused interventions and faster results for the nation’s most vulnerable students. QwertyTown 2.0 was launched earlier this year, QT 2.0 is a reimagining of the QwertyTown experience that K-12 students and teachers worldwide have adopted in their schools. QwertyTown 2.0 was rebuilt from the ground up in HTML5 making it compatible on any device, including Chromebooks, tablets, PCs and Macs. The student, teacher, and admin dashboards offer tons of new features in an intuitive design. eBOARDsolutions announced that Simbli board management software is now compliant with the latest standards of the Americans with Disabilities Act (ADA), making it easier for users of all abilities to participate in and stay updated on board activities through the online governance platform. This compliance means boards can be confident that content on their Simbli site is accessible to people with a range of disabilities, as set forth by the Web Content Accessibility Guidelines (WCAG). Type to Learn has partnered with Clever to simplify and secure the login process for students. Schools using Type to Learn can now have their students connect to Clever’s web-based platform to use Type to Learn’s next-generation software. Clever provides a single sign-on for all software used in school. With a limited window blocked out to learn typing skills, it is key that students get straight to learning without having to remember usernames and passwords. YouTube recently announced YouTube Learning, through which YouTube is providing grants and promotion to support education focused creator content, expert organizations and learners. YouTube is also expanding its learning content team efforts and has a newly dedicated product and engineering team working on building out features for learning on YouTube. Designed for applications such as education and corporate settings, Peerless-AV's Motorized Collaboration Cart (www.peerless-av.com) seamlessly interacts with touch-enabled technology, allowing users to focus on their presentation and foster a participative environment. The cart is ADA-compliant, offering display height adjustment up to 25.6” with the touch of a button. The cart is UL962 listed and features a safety limit function, which automatically reverses direction when a collision is detected in an upward, downward, or lateral force. Spectrum Industries Inc. (www.spectrumfurniture.com/en/) introduced its newest active learning solution, the TechCenter. The TechCenter comes in either a single (27.75” wide) or double (51” wide) unit. Different display options available for the TechCenter include optional dry erase boards and the ability to hold up to two 70” monitors. It also features a removable rear locking panel that provides full access to an optional 12 RU rack cube that can hold all AV or IT equipment. Hitachi America, Ltd. (www.hitachi-america.us/projectors) announced the newest expansion to its Collegiate Series line with the addition of two new 3LCD laser projectors. Both the LP-EU5002 and the LP-EW5002 offer 5,000 ANSI lumens of brightness, 20,000 hours light source life, up to 50,000 hours with Long Life 2 mode, multiple digital inputs (HDMI and HDMI/MHL), 3LCD projection technology, and a contrast ratio of 500,000:1, and Perfect Fit 2 for quick installation. HoverCam’s Pilot 3 (thehovercam.com) is a fully integrated wireless digital teaching station. 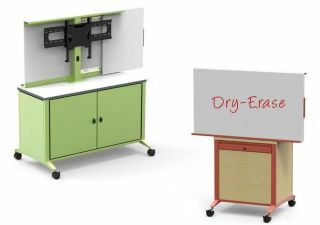 Featuring a Windows PC, 13-megapixel document camera, ClassFusion software, and 21-inch touch screen with wireless HD mirroring functionality in a mobile podium, the Pilot 3 eliminates the outdated AV cart and combines the most important elements used in today’s digital classrooms. Teachers are free to move about the classroom without being stuck to their desks. Whiteboard, annotation, and desktop marking functions are also available. Acer America (www.acer.com/ac/en/US/content/home) announced that its two new premium Chromebooks – the Acer Chromebook Spin 13 and Acer Chromebook 13 – will both be available through the channel to commercial customers in North America starting in September. Both models feature a stylish and durable all-aluminum design with a Full HD+ 13.5-inch display in a productivity-boosting 3:2 aspect ratio. The new Chromebooks provide the speed, simplicity and security required in professional environments. Middle Atlantic Products (www.middleatlantic.com) has announced the L7 Series Lectern. The solution merges a modern, curved design with motorized height-adjustability that is ADA-compliant and provides a welded steel frame with modular rackmount and storage options; integrated power, cable and thermal management for ultimate system reliability; and offers a 61-inch by 31-inch workspace to accommodate personal devices, a wireless charging pad to keep cellular devices charged, USB and AC outlets and storage for markers and microphones. BenQ’s (www.BenQ.com) new 4K RM Series includes the 65-inch RM6501K and 75-inch RM7501K IFPs. The RM Series IFPs feature TÜV-Certified Low Blue Light and Flicker-Free technologies, protecting students’ eyes from blue light emissions and flicker. The IFPs feature advanced touch enhancement, automatically converting handwriting to legible text, numbers, forms, and drawings. Students and teachers can even use different tools to write, draw, or paint on the surface for more collaborative or artistic sessions.